Faced with making quilts from the Asian star blocks AND the polka-dot blocks I was lucky enough to win two months in a row I decided to combine my booty and make one twin-sized quilt for my 10-year-old son Peter. I was able to buy a sparkly Asian-feeling green striped fabric for the sashing—-green’s his favorite color. And I grouped the blocks in sets of 4, with 2 dots and 2 stars each, to balance the patterns and make it more “boyish.” Needless to say, I wasn’t able to use blocks that had too much pink in them, or a couple of the cool blocks with pictures on them he didn’t like (“I won’t be able to sleep with that Asian woman looking at me!”). 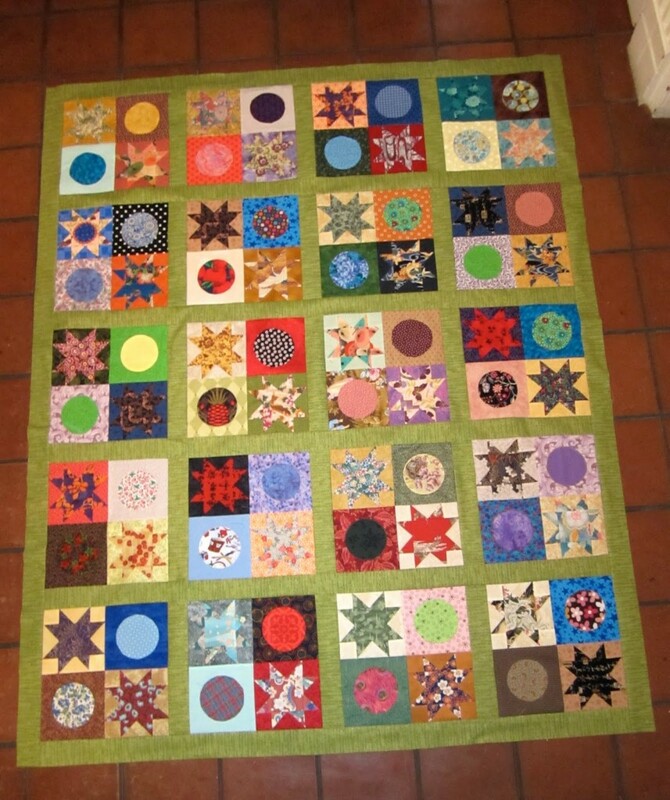 I’m already working to make a baby quilt for a girl with some of the left-over blocks.